Representative Jeff Denham’s constituents are fed up, and with just cause. After weeks of demanding an opportunity to meet with their Congressman face-to-face with zero response from Denham, hundreds of folks from his community decided to hold a peaceful candlelight vigil in his neighborhood in Turlock, CA last week. The cold temperature on a week night didn’t deter the crowd from passionately chanting “Denham: Do Your Job” and “What do we want? Healthcare! When do we want it? NOW!” for over an hour outside Denham’s gated community. During the vigil in Turlock, members of the community shared their alarm over threats to repeal the Affordable Care Act (ACA), especially without a replacement that would make health care better. Recent ICE raids and concerns over immigration policy were also expressed. Adam Weber, a student at California State University Stanislaus shared his story about the positive impact the ACA has had on his life (watch the full clip of Adam below). Marchers gathered at Markley Park before making their way to Denham’s home, where community members and local faith leaders convened for a candlelight vigil. Patty Hughes, a Modesto resident and organizer for the vigil, said that the gathering was held to get Denham’s attention. Hughes and other 10th District constituents have voiced their frustration at how difficult it has been to have their questions answered by Denham as of late, and the vigil comes at a time when Republican members of Congress are facing heated crowds and increasing pressure to protect healthcare and immigrants. As Hughes mentioned – Denham has had ample opportunity to meet with his constituents while on “Congressional Recess” (a week traditionally reserved for members of Congress to head home to meet with members of their community). Two weeks ago, over 300 constituents showed up at a Town Hall in Modesto and hoped to hear from their representative Denham. He did not attend. 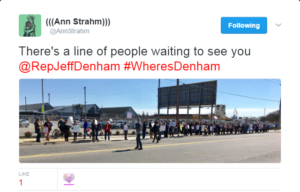 Denham’s office maintains that he provides opportunities to hear from his community with “mobile town halls”; however several folks in the crowd on Thursday night said they have tried to call in to these “town hall conference calls” and have been told that they cannot ask their question(s). Denham’s office chooses questions beforehand and omits questions from folks concerned about major issues like healthcare and immigration. The emergency vigil in Turlock was part of a statewide day of action with thousands around California calling on their Representatives to meet with them to hear concerns over recent threats and attacks to their healthcare and to immigrant families in their communities.